At 14.1%, healthcare is the third largest weighted sector in the S&P 500 index, and with 76 million baby boomers getting older and living longer, owning healthcare stocks in your portfolio makes sense. However, it can be hard knowing what healthcare stocks are best to buy, and it can be even tougher figuring out when it makes the most sense to be buying them. To help make healthcare investing easier, we asked some of our top Motley Fool contributors what healthcare stocks they think can be bought right now. Their picks were Intercept Pharmaceuticals (Nasdaq: ICPT), Celgene Corp. (Nasdaq:CELG) and bluebird bio (Nasdaq: BLUE). Read on to learn why these are their favorite healthcare stocks to buy this month and if they're right for your portfolio. Sean Williams (Intercept Pharmaceuticals): I'm totally going to play the "homer" card and suggest that healthcare investors take a closer look at small-cap biotech Intercept Pharmaceuticals in November. It's a fairly recent addition to my portfolio. Intercept Pharmaceuticals was taken to the woodshed in September, losing more than half its value after the Food and Drug Administration disclosed that 19 people taking Ocaliva, the company's lone-approved drug, for primary biliary cholangitis (PBC) had died. A slew of Wall Street downgrades followed the news amid concerns that Ocaliva may not be as safe as everyone thought. However, the bull case at this point, with Intercept now more than 85% below its all-time high, is huge. To begin with, many of the PBC patients who died were being overdosed. The company recommends that the sickest PBC patients receive only one 5 mg oral pill per week. Apparently, some of these sick patients were receiving one pill per day. Educating physicians and patients should reduce the number of further PBC-related complications. Second, none of Intercept's previous clinical studies suggests any adverse events out of the ordinary with the placebo. Neither the phase 2 Flint study in nonalcoholic steatohepatitis (NASH) nor the midstage Aesop study in primary sclerosing cholangitis (PSC) showed any severe adverse events outside the norm of the placebo arms. Different diseases can react differently to a drug, but I see no cause for alarm in the safety of Ocaliva in treating NASH or PSC patients based on the study data we have so far. Of course, the real value here is NASH. Some 2% to 5% of all U.S. adults have NASH, which can lead to liver fibrosis, liver cancer, and even death. It'll be the leading cause of liver transplants by sometime next decade. In the Flint study, Ocaliva demonstrated encouraging improvements in lowering the non-alcoholic fatty liver disease activity score, treating fibrosis, and leading to NASH resolution. The ongoing phase 3 Regenerate trial, which should read out in the first-half of 2019, will simply need to meet a statistically significant improvement in NASH resolution or fibrosis to hit its endpoint, which I believe is pretty feasible. At this point, you're getting the NASH business almost for free, which is why I find this stock so intriguing. If Ocaliva is approved to treat NASH, I believe it could near $2 billion in peak annual sales, which would give Intercept considerable upside from here. Brian Feroldi (Celgene): It's been a rough couple of weeks for investors in biotech giant Celgene. A few weeks ago we learned that a pipeline drug called GED-0301 failed miserably in an important late-stage trial. Then management announced that sales of its fast-growing psoriasis medicine, Otezla, was slowing down. When combined, management was forced to dial back its short- and long-term financial guidance. 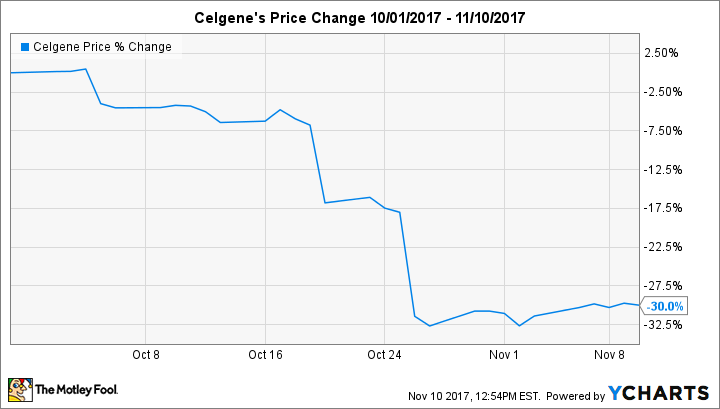 Despite all the recent doom and gloom, I firmly believe that Celgene's stock can bounce back strongly from here, for a few reasons. First, management is still projecting annualized revenue and profit growth of 14.5% and 20%, respectively, between now and 2020. While that's down slightly from its prior guidance, those are still terrific numbers in absolute terms. Second, Celgene's pipeline is still packed with potential. The company counts more than 50 molecules in various stages of development, many of which hold blockbuster potential. Third, management told investors that it's going to immediately initiate a "strong share-repurchase program" to take advantage of the share-price weakness. With more than $12 billion in cash, the company certainly has a big enough bank account to take meaningful action. Add it all up, and it's clear that Celgene's future still looks incredibly bright. With shares currently trading around 11 times next year's earnings estimates, now is a fantastic time to get in. Todd Campbell (bluebird bio): Potential in a multibillion-dollar market for cancer drugs? Check. Potential to reshape how we treat rare disease? Check. Those are two big reasons bluebird bio ought to be on everyone's radar, especially ahead of its presentations at the American Society of Hematology (ASH) meeting next month. At the conference, bluebird bio will roll out updated data on bb2121 in multiple myeloma, a cancer market valued at north of $10 billion annually. It will also update its progress in developing LentiGlobin in beta-thalassemia and sickle-cell disease, two rare blood diseases. I think the odds are pretty good that the company's data will impress, and if I'm right, then picking up shares this month could pay off. At the American Society of Clinical Oncology annual conference in June, bb2121 stole the show with a 100% response rate in heavily pre-treated melanoma patients, and earlier this month, a sneak peek at the LentiGlobin sickle cell anemia abstract for the ASH conference suggests it could reshape patient treatment one day. This is a high-risk stock without any commercial-stage drugs, but its research into supercharging the immune system to defeat cancer and gene therapy is on the cutting edge, and $1.1 billion in cash on its balance sheet means it has plenty of financial flexibility. It also isn't a cheap stock by any financial measure, but I think it's one of the most intriguing biotech stocks out there. Picking up shares ahead of the December presentations could be a smart move. This article originally appeared on The Motley Fool and was written by Todd Campbell, Sean Williams, and Brian Feroldi. Donald Trump Takes On Drug Prices -- Should You Sell Your Drug Stocks?